The heat is clearly getting to me and I'm starting to think completely bonkers thoughts for this time of the morning. Latest line of completely bonkers thinking? R2-D2 and C3PO in a New Hope are modelled on Rosencrantz and Guildenstern from Hamlet. - both sets of characters are supplementary to the main character. - both sets of characters are tasked with the delivery of an important message. - both sets of characters are generally either lost, confused or following the paths laid out by others. C3PO is clearly Rosencrantz (or possibly Guildenstern). Often confused, generally following aimlessly and hoping for the best. Completely out of his depth. R2-D2 is clearly Guildenstern (or possibly Rosencrantz). Far more purposeful and aware of his responsibility but still largely controlled by the task he has been commissioned to fulfil. In the next episode: How Romeo and Juliet was clearly modelled on Attack of the Clones. 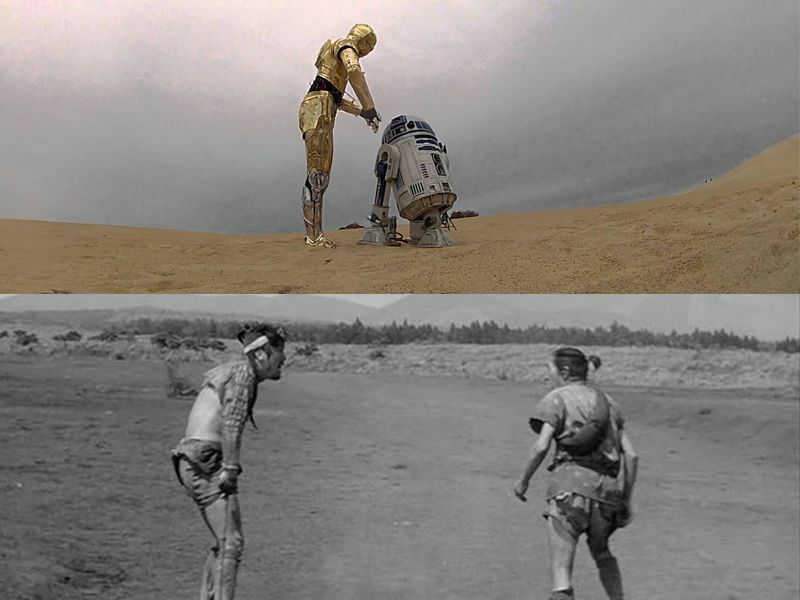 George Lucas famously based R2-D2 and C3PO on characters from Akira Kurosawa's "The Hidden Fortress". Akira Kurosawa was really into Shakespeare, adapting a couple of the plays to a feudal Japanese setting and lifting elements for other films. So you might not be far off. Is this a game of Questions? Can't do videos on this old comm unit. George Lucas famously based R2-D2 and C3PO on characters from Akira Kurosawa's "The Hidden Fortress"
"Rosencrantz and Guildenstern Are Dead" has to be Stoppard's finest piece of work. The Disney version with Tim Roth and Gary Oldman is outstanding (and unfortunately incredibly hard to find on DVD now). It was performed in London last year with Daniel Radcliffe as Rosencrantz (or Guildenstern) and was a close second. Richard Dreyfuss, for me, absolutely nailed the part of Playmaster so the Disney version still has the edge. Thank you - sounds like one for The List. "Rosencrantz and Guildenstern Are Dead" has to be Stoppard's finest piece of work. The Disney version with Tim Roth and Gary Oldman is outstanding (and unfortunately incredibly hard to find on DVD now). Well this chat made me have another look, gave up looking for this a while back and low and behold there's a 25th Anniverary edition available on Amazon as I type.